An important question for the CAA: Is a 1.4% improvement in track-keeping REALLY worth making a misery of the lives of thousands of residents newly overflown by Route 4? Press release 24 Jan 2017: In its Blog posted on 23rd December 2016, Gatwick told residents that in its opinion the redesign of Route 4 had “achieved what was required”. This design, Gatwick told residents, was keeping 94% of aircraft on-track, as compared to the 92.6% that were on-track under the 2012 legacy position of Route 4. But it is the CAA and not Gatwick that will decide the fate of troubled residents, who have this burning question for the regulator: Is a marginal 1.4% improvement in track-keeping REALLY worth trashing the lives of many thousands of residents being newly overflown by Route 4? Gatwick have also revealed for the first time that nearly 2,000 people were moved to write to the Gatwick Route 4 feedback line and that 250 people were so upset they did so more than forty times. Nick Eva from Norwood Hill commented: “When the first redesign of Route 4 had the effect of pushing the Route into South Dorking and Reigate in 2013-2015, a residents’ petition gained roughly 2,000 signatures and played a significant part in the Route being changed by the CAA. 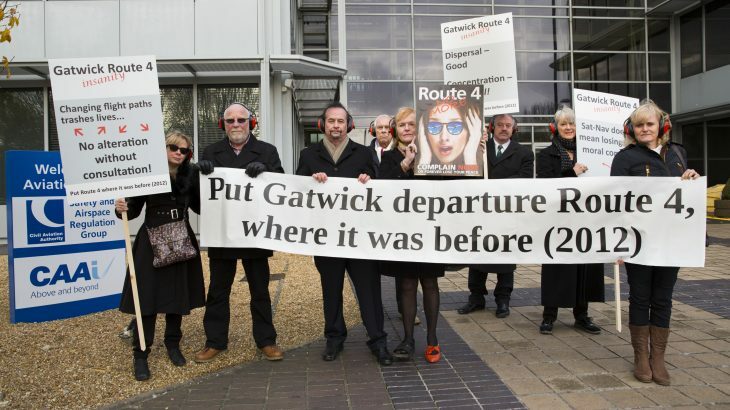 The fact nearly 2,000 people felt moved to write to Gatwick this time round, and with a significant number of people feeling the need to write on many occasions, demonstrates the depth of feeling by distraught residents to the 2016 Route 4. Gatwick’s Blog also believes that the over-tight turn of the current Route 4 is delivering ‘dispersal’ which, according to the Blog, was “particularly requested by local communities”. But to call what’s happening on the R4 turn “dispersal” is disingenuous. The turn is ballooning out as aircraft struggle to fly it and where the vast majority blow out of the speed limit, imposed in an attempt to make the turn flyable. These aircraft have flaps deployed and are spraying increased levels of noise across populations in Newdigate and Capel not overflown before. To refer to this disorderly failure of the majority of aircraft to execute the turn as “dispersal”, is surely an abuse of language? Gatwick have also conceded in their Blog that the new Route is liable to being blown off course by winds, and that they have abandoned any current plans to address this. They also accept that flying aircraft at low speeds with the use of flaps is likely to create more noise than would be the case if the aircraft was in a ‘clean’ configuration. Residents are also incredulous that the Gatwick Blog considers overflights of Horley a ‘separate issue’ from the new design of Route 4. This seems like wishful thinking, given that increased overflights of Horley by vectored aircraft only began after the inception of the new Route 4 in May 2016. Because of the new Route 4’s more southerly trajectory after the turn, Air Traffic Controllers now have a narrower corridor in which to vector aircraft than they had with the 2012 legacy Route.